Tilted Horizons: Hawk's Nest Cafe to rise again!? Hawk's Nest Cafe to rise again!? Great news for motorcyclists in the northeast U.S.; the Hawk's Nest Cafe may come back. The former owner has begun turning the bureaucratic wheels with the hope of rebuilding the popular motorcyclist hang-out on its former location. 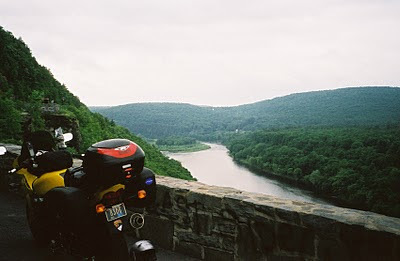 For those unfamiliar, the "Hawk's Nest" is the unofficial name for a very twisty, scenic, European-feeling (but sadly short) section of NY 97 that runs high above the Delaware River northwest of Port Jervis. It's the type of road no serious motorcyclist can resist, and has been used in numerous auto commercials over the years. (I believe I shot the photos in 1998 and 2004). It's so much fun that a few times I've turned back after the road straightens out and rode the twisty section again in the opposite direction -- once I did it repeatedly until it raised suspicion of a local gendarme, who approached me when I stopped at one of the scenic pull-outs and inquired what I was looking for. Fun, officer, just fun. The Hawk's Nest Cafe was owned by an avid motorcyclist. It sat just off the road and the lot was always full of motorcycles of all types, along with a few sports cars, etc. Having stopped there for a few times prior, but not since 2001, I was looking forward to a much-needed break and chow on a very rainy day in 2004 on my way to Americade. I arrived at what I remembered to be the Cafe, only to find it had burned to the ground in October 2002, and wishing I had shot some pics of the license-plate festooned interior and outdoor deck overlooking the river when I had the chance. Hopefully, the Hawk's Nest Cafe will soon arise like the Phoenix and give me another chance. I do 10,15 laps before I've had enough.Love showing the folks watching that a Harley can go like a dog on fire.My ride is a 2000 Super Glide Sport,FXDX.